The Cobblestone Society is pleased to welcome the Pullman Memorial Universalist Church and the Gaines Congregational United Church of Christ to Albion’s Annual Patriotic Service, held this year on Sunday, July 1 at 11 am at the 1834 Cobblestone Church, Childs NY. 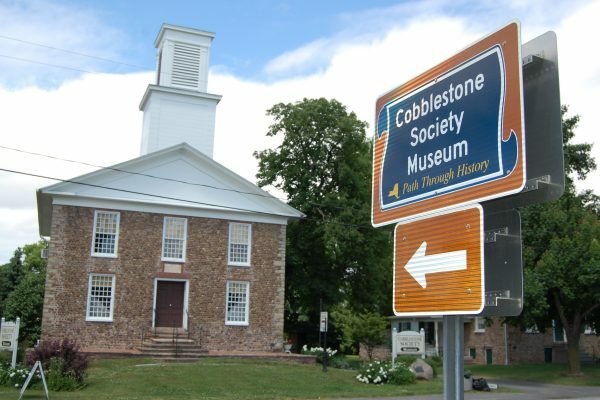 The Cobblestone Church is part of the Cobblestone National Historic Landmark District, the highest honor bestowed upon historic properties by the National Park Service, Department of the Interior. Soloists Maarit Vaga and Matilda Erakare will be singing and leading several patriotic songs. Born in Tampere, Finland, Vaga studied at the Juilliard School of Music under the tutelage of Maestro Vincent La Selva, director of the New York Grand Opera at Carnegie Hall. Vaga has appeared in several operas, including Madame Butterfly, Sister Angelica, La Boheme, and Rigoletto. Vaga’s performances and concerts earned her the 2002-2003 Finlandia Foundation’s Performer of the Year award. Matilda Erakare, born in Everett, WA is the youngest in a family of musicians. She started piano lessons at 4 and soon added cello lessons, first with Jonathan Jaeger and then at the Eastman Community School of Music with Diego Garcia. In addition to music lessons, Matilda honed her skills as a dancer-singer-actor or “triple-threat” in Broadway parlance, and has appeared in numerous Albion High School musicals. When not playing a leading role on stage, she participated in the pit orchestra and was a member of the Albion Purple Eagle’s Marching Band Drum Corps, playing the quads. She frequently performs with her guitarist father, Jan-Mikael at various events around western NY. Matilda will be finishing Genesee Community College this fall and is planning on continuing her studies in photography. This free service is open to the public and will include patriotic readings which will be both historic and uplifting, as promised by Lay Leader Darrell Dyke of the Pullman Memorial Church. A free-will offering will be collected to benefit the Cobblestone Society. Make plans now to attend on July 1 at 11 am at 14389 Ridge Road West in Albion. Ample parking is located behind the church.